Radish ‘Wurzbourg' (Raphanus sativus 'Wurzbourg'): growing, planting, caring. Large red globes, ideal for summer harvests. Radish - Raphanus sativus — from the Latin radix, radicis, "root, horseradish", from the Greek raiforaas, "turnip" is a biennial garden plant from the Brassicaceae family, cultivated for its swollen tap roots, eaten raw, like a vegetable. The term also indicates the vegetable. The edible part, a tap root with white flesh, is the underground swollen part of the stem, above the root. The radish's skin can be different colors, the most common being red. Some varieties can have pink, white, or gray-white skin. Sow the variety 'Wurzburg' from June - not that it does not grow well before, but it is one of the rare varieties that supports the heat! Radishes like sunny exposures where they will grow better, but they accept the semi-shade. They need a light and fresh soil - of any type, provided it is sufficiently loosened! Radishes don't handle drought very well and go to seed or even better, become "hot"! Thus, sow at a time when you can watch over them and give them water regularly if needed. In loosened earth that has been freed of rocks, trace 2 centimeter deep grooves, spaced about 10 centimeters from each other. Sow your seeds, mixed beforehand with some sand to more efficiently distribute them. Cover with a think layer (about 1 centimeter) of potting soil and tamp down properly. Vary, from one sowing to another, the spots: don't keep one place for them permanently as these vegetables suffer from always being cultivated in the same place. You can sow them with carrot seeds. The association is beneficial. Radishes need light but frequent watering. - it's how to guarantee a sweet taste! Keep the soil cool until the harvest, especially in summer. For once, you can go all out: wetting the leaves chases off flea beetles — also called garden fleas — just about the only pest that has the time to attack radishes! After sprouting, thin out the plants by leaving only one small sturdy plant every 4 to 5 centimeters to facilitate their growth. Harvests should be done regularly as soon as the radishes have formed: you must not wait too long as they will quickly become tough and bitter. Consider spacing out your plantings so as to be able to harvest all summer! 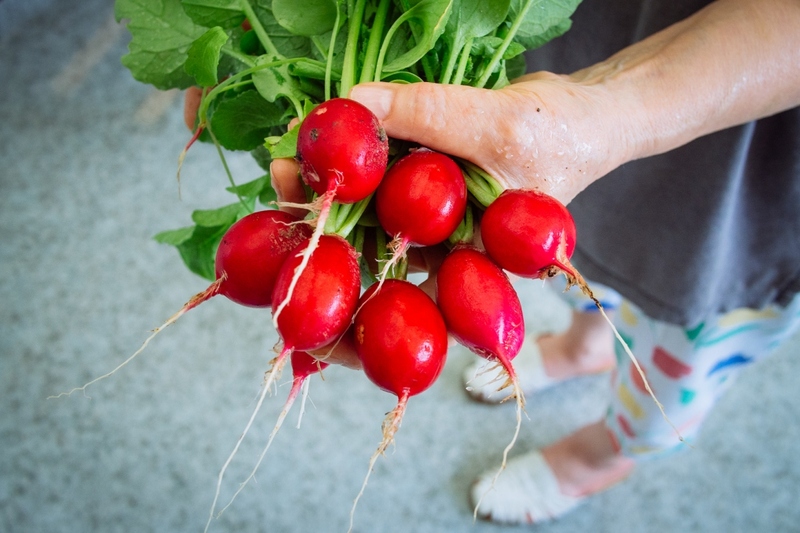 You can then cultivate your radishes in your garden's empty spots between other crops. If you have harvested everything, or the remaining radishes are too hard, you can tear them off and compost them.